How to Remove Hard Water Stains on Pool Tiles – Mees Distributors, Inc.
Now that you have your pool tile selected and installed, knowing how to properly maintain it is the next step. 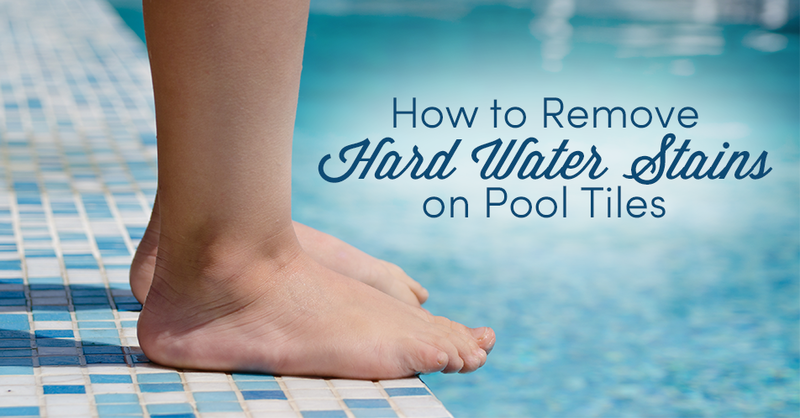 Hard water stains are a common problem for pool tile, and it’s important to know how to clean it if it does occur. The following information is courtesy of our team of professionals to help you remove hard water stains and keep your pool looking great all summer. Step 1: Choose a well-ventilated area to work and put on the rubber gloves, respirator and eye protection. Step 2: Fill a non-metallic bucket with one gallon of water. Measure out eight ounces of muriatic acid in your measuring cup. Step 3: Slowly pour the muriatic acid into the one gallon of water. Never try to add water directly to the muriatic acid, as this can cause undiluted acid to splash onto your skin or clothes. Throw the used measuring cup away. Step 4: Slowly stir the mixture with the paint stirrer until completely combined. The mixture may get hot, so be very careful. If the mixture heats up, let it cool completely before continuing. Throw the paint stirrer away. Step 5: Carefully fill the spray bottle with mixture. Avoid splashing because even the diluted mixture can cause serious damage. Step 6: Spray the mixture directly onto your pool tiles. Let it sit for a moment, then use the light scouring pad to remove the hard water stains. Remember, no one should be in the pool while you are cleaning the tiles. Step 7: Use a clean rag to remove any residue after scrubbing the tiles. Step 8: Throw away the spray bottle, rag and scouring pad, and dispose of any leftover mixture according to your local regulations. Step 9: Test the water of your pool to make sure it is safe before getting in. If you don’t want to clean your tiles and would rather start from scratch, we can help! Mees Distributors, Inc. is one of the most trusted ceramic tiles and natural stone resources in the Midwest. Contact a customer service representative today to learn more about tiles for your pool, hot tub or sauna.